Welcome to Sealladh Na Mara. John and Lesley (Who live next door) invite you to a new self catering accommodation opened in 2017. We sit in an elevated position over looking the white sands of Morar which is less than a 5 minute walk. Morar is half way between the towns of Arisaig and Mallaig where you can take trips to the small isles or visit the isle of Skye on the Calmac car ferry. Not only famous for its scenery you can also fish, golf, kayak, pony trekking and many other outdoor activities. During the summer months you can watch the ‘Harry Potter’ steam train arrive at Morar station as you have a barbecue or picnic on the beach. On the ground floor there is a fully fitted kitchen with, an oven, hob, microwave, fridge/freezer, washer/drier etc. The kitchen is open plan into the living and dining area which has a smart TV and a wood burning stove (logs provided at no extra cost). 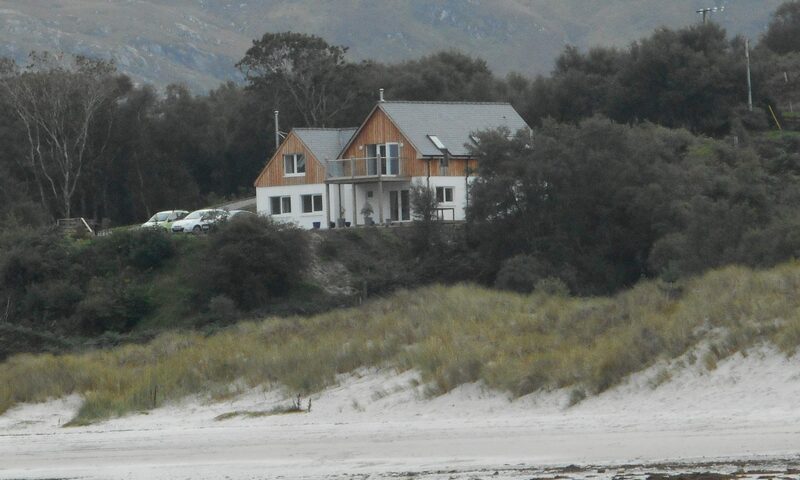 All rooms have spectacular views over the white sands of Morar. Guests have their own decking area and a barbecue. Some of the many attractions in the area include: fishing, pony trekking, golf, hill walking, steam train, archery, kayaking and boat trips to the islands from the harbours of Arisaig and Mallaig both only 5 minutes drive. ( Some activities can be seasonal). Summer in Sealladh Na Mara :- Wonderful long walks on the white sands- boat trips on the azure sea (whale and dolphin spotting)- stunning sunsets. Winter in Sealladh Na Mara:- Bracing weather- short days- lively walks on the beach- log burner on and pour yourself a dram. Stargazing ( no light pollution). The nearest town, Mallaig is only 3 miles away where you can shop for your groceries – also has 4/5 good seafood restaurants. Also you can catch a ferry to Skye. Arisaig is a small village which is only 4 miles away with a hotel, restaurant and trips to the small isles. The bustling town of Fort William is only 45 minutes drive with its busy shops, bars and is famous for skiing and mountaineering. Well behaved pets are welcome (A surcharge of £40 per week) – All the house rules will be explained. Please contact us if you wish to discuss any questions you may want to ask.